The Okavango Delta is the world's largest inland delta as the Okavango River, a tributary of the Zambezi, spills into the Kalahari Desert, creating a vast oasis over 15,000 km². The Delta comprises numerous water channels, lagoons and small islands. The region is rich in animal life, including elephant, giraffe, buffalo, lion, hyena, hippos and many antelope species, as well as a myriad of migratory birds. 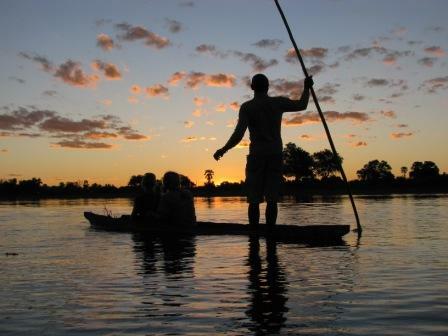 The Delta is best explored in traditional mokoro, the traditional dugout canoe, poled by skilled local guides. They navigate through a maze of narrow creeks and channels, cutting through beds of reeds, in one of the most relaxing and unique experiences Africa has to offer. This is African wilderness at its best - wildlife and a stunning natural setting in pristine, untouched land. The Okavango has numerous lodges or small islands to bush-camp (depending on your budget) which allows you to take a walking or horse-riding safari to spot the rich animal and bird life, swim in the waters (though beware crocodiles) and take mokoro trips to view the beautiful sunsets over the Delta. Organised group tours: Click here to see 9 tours to Botswana which may include Okavango Delta.